studio tour in our neighbourhood. This year, 10 of the studios will be open to the public on September 27th & 28th, from 11 to 4 p.m. This is a self-guided bikeable and walkable tour and is a great way to discover original art and Vic Westâ��s community spirit. Look for bright turquoise banners marking the open studios. Artists will be on hand in their studios to answer questions and will showcase a variety of works, including: original oil, watercolour and acrylic paintings, drawings, textiles, lino prints, jewellery, doll artistry, leaded glass and mixed media sculpture. Many of the artists use a variety of mixed media in their pieces. The VWAQ will also host a Group Show for the month of September starting September 3rd at the Spiral Cafe, 418 Craigflower Road. Everyone is welcome to attend the opening reception on September 12th, from 7 to 9 pm where brochures and maps to artistâ��s studios will be available. 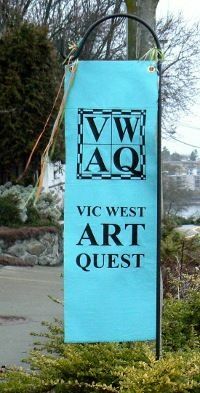 See also www.vicwestartquest.com for maps and information on the participating Studio Tour artists and the entire group. The website also has information on our involvement in the community and random acts of art. Background: The Vic West Art Quest began in 2007 when a group of neighbourhood artists organized the first studio tour. We celebrate the richness and diversity of the visual arts in Victoria West. We build community â�� between artists who live and work in Vic West, and between artists and our neighbours. We get together to see each others work and studio space, to talk about art, and to plan our group shows, the studio tour and other community art events. One of us exhibits each month on a special VWAQ wall at the Spiral CafÃ©.